Asian sweet potatoes are my new favorite vegetable. They’re more red in color, than orange. I’m not sure if you can tell from the picture, but this potato is pretty red. I was surprised when I cut it open. See? It’s white on the inside. Shocking! I first had them roasted at my friend Jen’s house. The texture of the Asian sweet potato is more like a russet potato but it has the sweetness of a regular sweet potato but not quite as sweet. So if someone you cook for isn’t crazy about sweet potatoes, you might want to give these a try. You might find them at your market labeled as Asian or Japanese sweet potatoes. I got mine at Healthy Living Market in Saratoga. 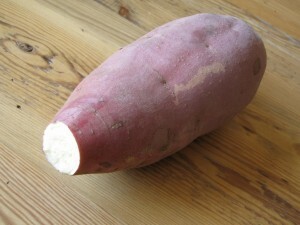 You might also be able to find white sweet potatoes, which are similar, in your market. 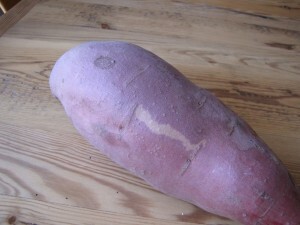 To roast an Asian sweet potato, preheat your oven to 400F. 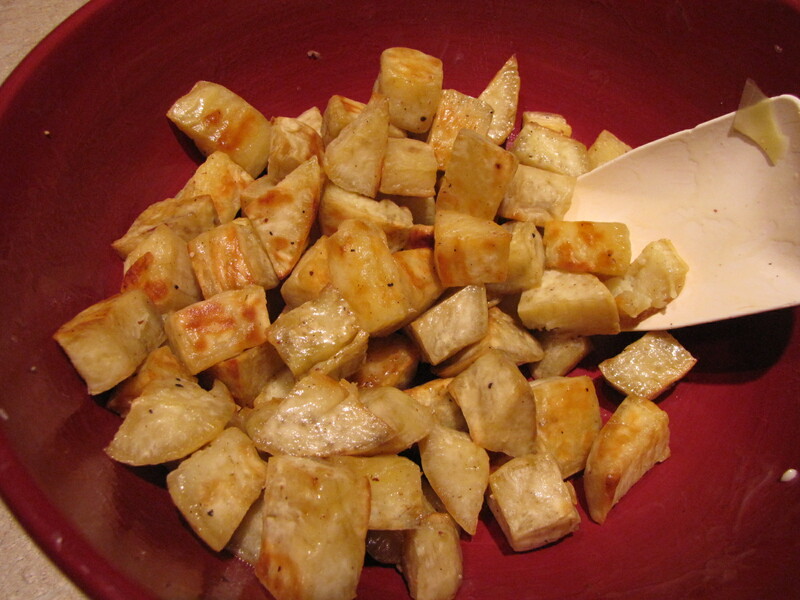 Peel the sweet potato, cut into 1″ to 1 1/2″ cubes, toss with olive oil, salt and pepper. Stir. 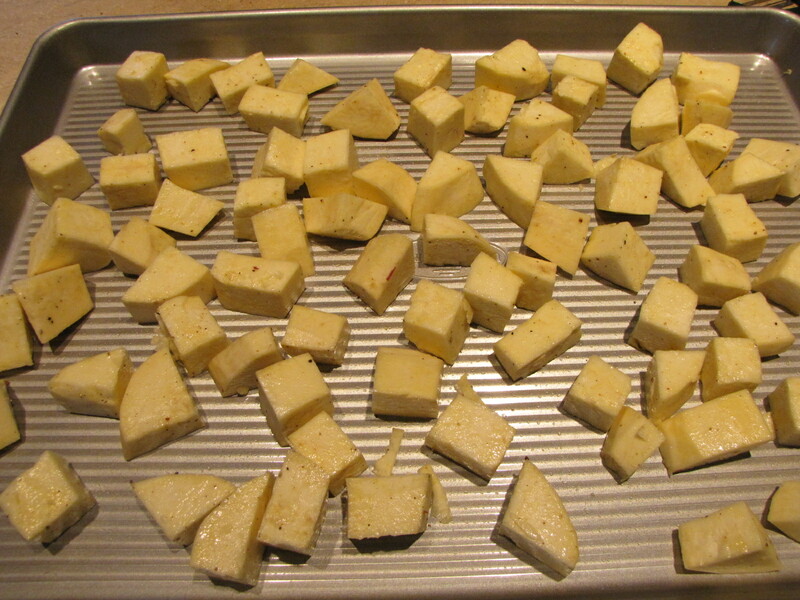 Bake on a rimmed baking sheet for about 30 minutes or until tender. Halfway through, stir and add more oil if the potatoes are a little dry. 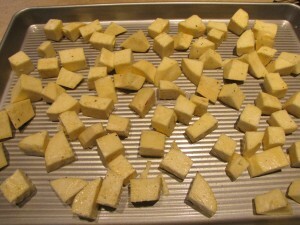 Serve as is or the way I like mine – with BUTTER! I like mine with butter. You can them into french fries and dip in sriracha which is really good too. Blight, Rabbits and Woodchucks – Oh My! Sounds yummy. Going to have to try!